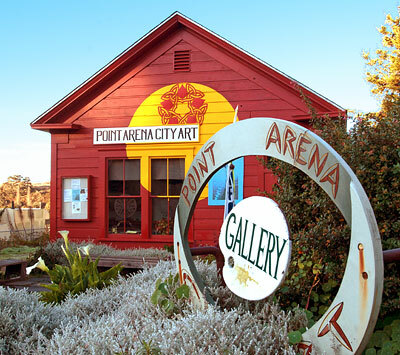 "This small house represents the second wave of home-building in Point Arena, in which functionality was supplemented by a bit of decoration and some elements of style. Here the hood molding on the front windows provided the decoration while the cornice return and pedimented front entry gave an indication of the Greek Revival. This style was popular in California from statehood to the coming of the Queen Anne (i. e., 1850-1880) and was used both by designers deliberately emulating classical forms and by less sophisticated builders merely following precedent. The latter probably occurred in this case, since the building lacks the symmetrical facade usually associated with the style and has no classical detailing except perhaps the hood molding. Nevertheless, the building is an excellent example of small houses of the period. The braces to the roof over the front door, which replaced narrow posts sometime in this century, constitute the only alteration. The house once had a twin next door, which burned down about eighty years ago. The building has a place in local lore, because its most prominent former owner, Annie Palmer, ended her teaching career at the Methodist school on the Point Arena Rancheria by murdering her lover in spectacular fashion."